I believe I owe you a weekly recap, don’t I? I’ve been a little behind in reporting my noms, but don’t worry, I’ve been snapping pics all week. 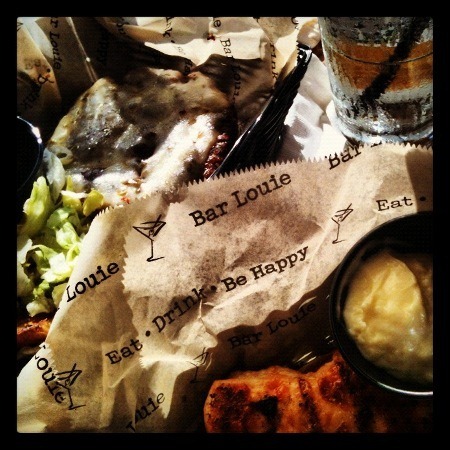 Tuesday I again went to Bar Louie for Happy Hour and $1 burger specials with a few friends and co-workers. I always rock a pair of sandwiches (sans bun). Because I can. Beef + pepper jack cheese + olives and Chicken + mayo! 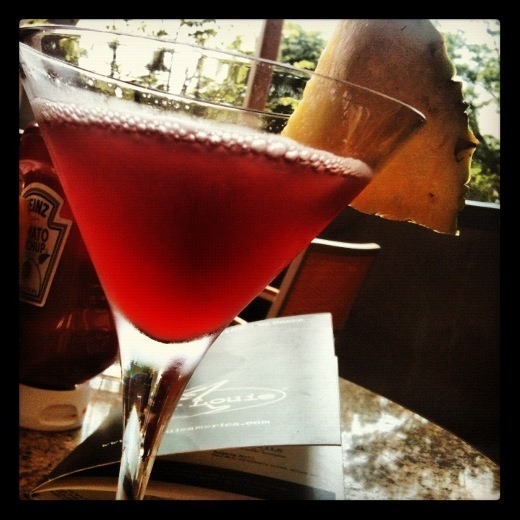 “The Diva” has become our favorite Happy Hour martini. Sinfully sweet pineapple-ness. I was rockin’ the $5 ‘tinis as well. On Wednesday night I headed north to Fenton to visit my BFF and her new apartment. We haven’t had much one-on-one bonding time for the past few months, since she moved south with her fiancé, temporarily, at the beginning of the year. She has since moved back to the mitten (with him! ), and this was our first one-on-one dinner date in quite a while. As has been documented, BFF and I are big fans of Highland House in Highland, Michigan. Well, the family who owns Highland House also runs a restaurant called Fenton House, and this is where we decided to grab dinner. 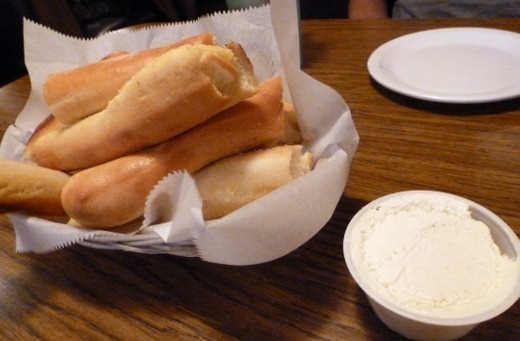 Lots of that warm, buttery irresistible bread was consumed, with foodgasmic cheese spread. 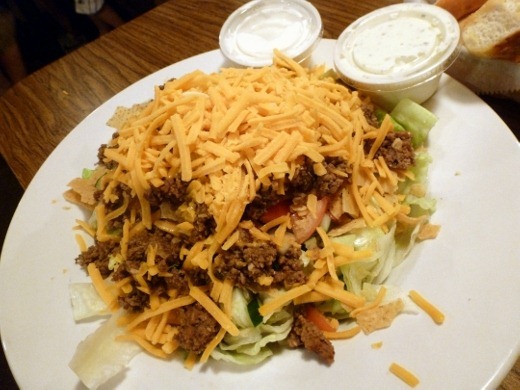 I also ate about 40% of this ginormous taco salad and brought the rest home for lunch the next day a midnight snack. After dinner, margaritas were attempted, but the restaurant we had in mind was packed, so we instead went back to BFF’s place for sangria on the balcony. Sounds like a win to me! 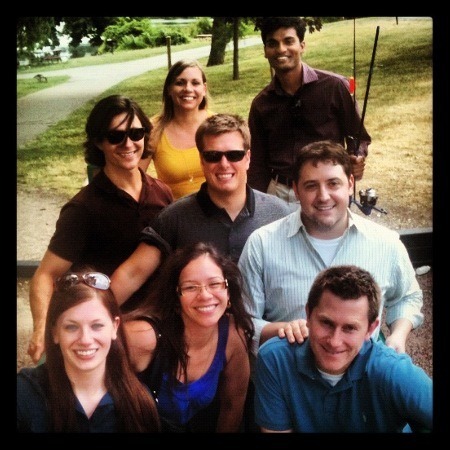 On Thursday, our office staff enjoyed Dibella’s sandwiches on the picnic tables at Gallup Park for lunch. I thought I ordered my standard Old Fashioned Assorted, but wound up with tuna! I enjoy tuna too, so this worked out fine for me. As long as I get my Everything Bread, I am a happy camper nommer. 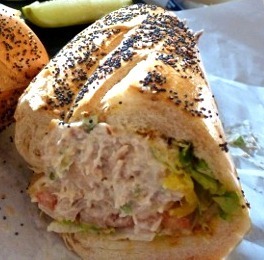 After eating this hearty tuna sandwich for lunch, I only had room for a small dinner. 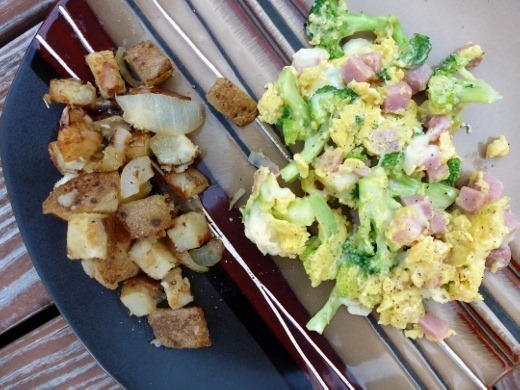 This Ham & Broccoli Frittata recipe was on the menu, so I simplified it, and served it up to the huz, with a small portion for my not-very-hungry self. For Friday lunch, a sushi craving was satiated at Nagomi Sushi. I’m becoming a fan of this place. 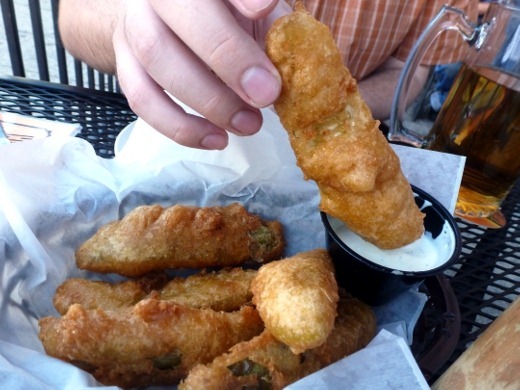 Really good food, good prices, fast service. I ordered the two roll combo for lunch, with a Philadelphia roll and a Spicy Crunch Tuna roll, served with miso soup. 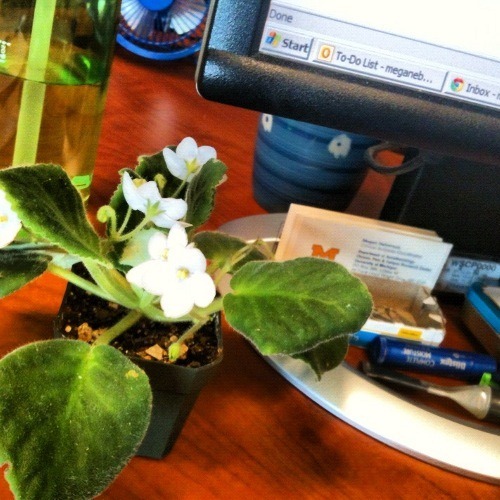 Speaking of work, one of my African Violets made it to the office. My desk is probably 12 feet or so from the window, so very minimal natural light, but a little. My uncle suggested that this specific plant requires little light, so I hope it does well. After work, the huz and I had dinner at Sidetrack. You know it’s my favorite place. B. Nektar’s Zombie Killer (made in Ferndale, Michigan, with a rating of 99 on the RateBeer website!) for me and Woodchuck for Tom. 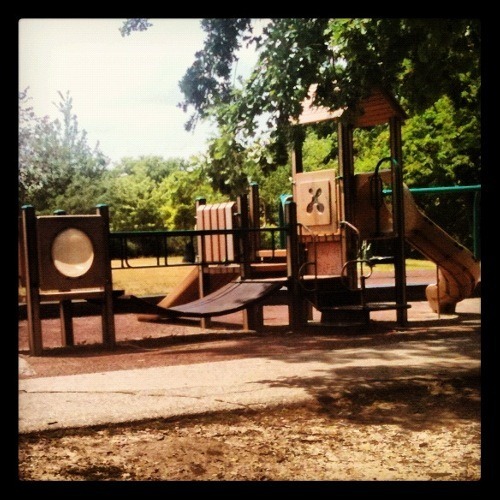 Because…. That. Is what you do. When you go. To Sidetrack. I think an 80 mph Amtrak train sped by at right about this moment. 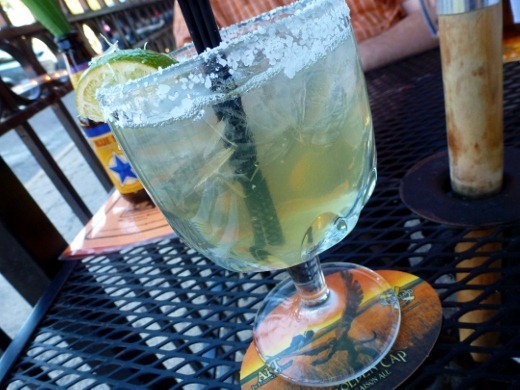 That 10 oz snifter of Zombie Killer left me wanting more, so I fed my margarita obsession. Whoa, this marg (on the rocks) was way better than my last Sidetrack marg (frozen). 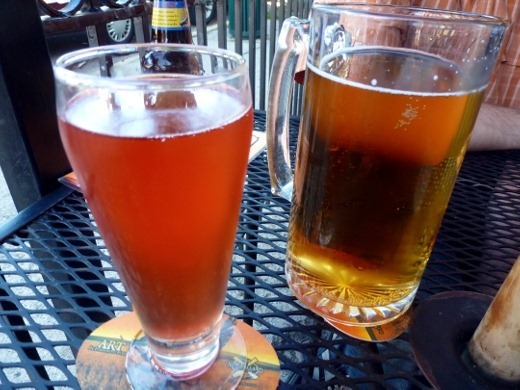 As I’ve probably said, I think my current obsession is due mainly to the salted rim. 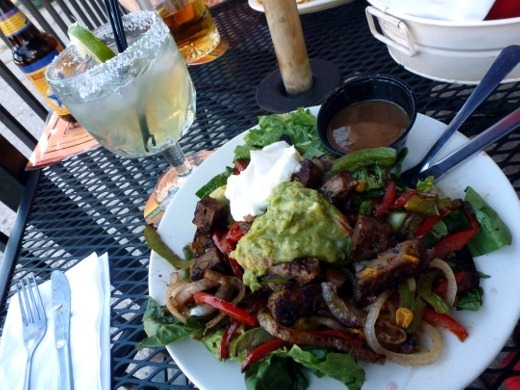 I ordered the Chicken Margarita (muahaha!) Salad, but subbed Sidetrack’s epic black bean burger for the chicken, which meant no margarita marinade for me, but I love the black bean burger so much that it was worth it. This is an awesome veggie-filled salad. 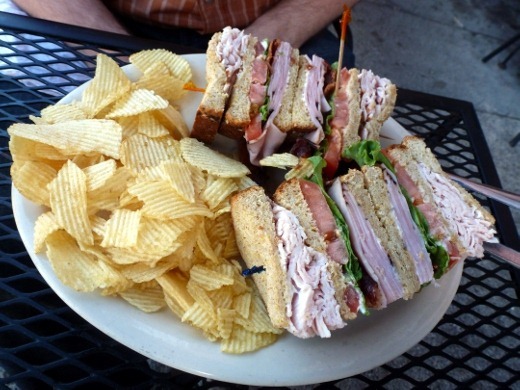 An insane club sandwich for the man in my life. No dessert for us this night. Totally unnecessary after the sweet drinks and massive quantities of food! Currently listening to: Soft Shock – Yeah Yeah Yeahs. Can’t get this beat outta my head. Pingback: Northwest Salmon Salad « Meg.Goes.Nom.Nom. 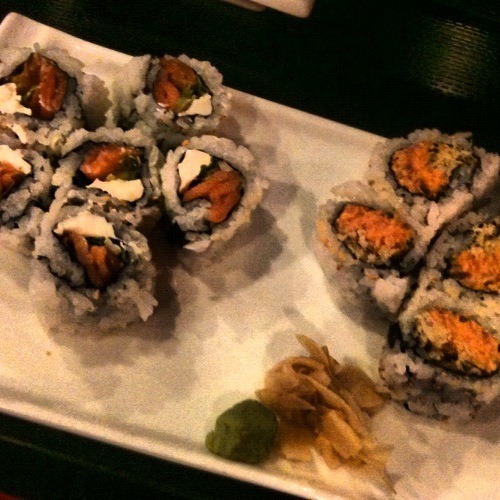 Pingback: Sushi and Veggie Cravings « Meg.Goes.Nom.Nom.